Paper Stamp Scissors: PPC 100 - Let's Celebrate!!! PPC 100 - Let's Celebrate!!! I hope you are all well and getting ready for a fantastic weekend! It is Friday, which means it is time for a new Playing in Paradise Challenge over at Scrapbooker's Paradise. However, this is no ordinary challenge - it is our 100th, so we are having a celebration!!! I hope you will join in the fun with us! For our 100th challenge celebration, our theme is 'Let's Celebrate Together!' So, this week we would love to see your celebration projects. It could be any type of celebration - birthday, birth, wedding, anniversary, graduation, etc. 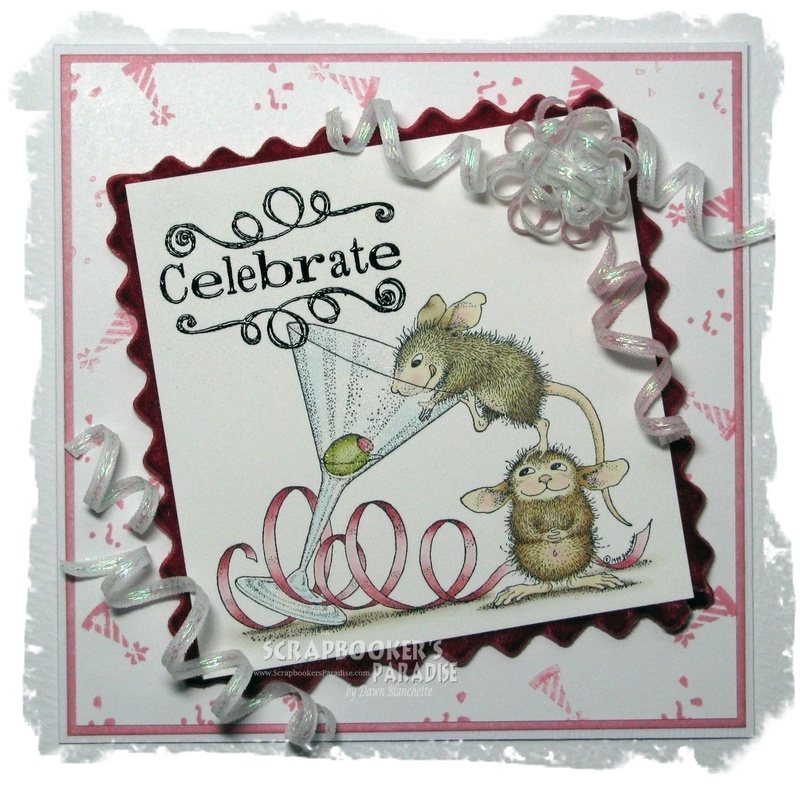 These little mice really know how to celebrate! Image - House Mouse (coloured with Distress Inks) and I think the sentiment might be from Inkadinkado (embossed with black embossing powder). I went over the glass with my clear Copic atyou spica marker for a really fine glittery look. Paper - White card, coloured with Distress ink and stamped with a couple of stamps from a Stampin up set. Other - velvet ribbon from my stash for framing the image and wired sparkly ribbon from my stash to make a party bow and confetti. I used fabric stiffener on the wired ribbon to help it hold its shape and prevent it from getting squished. To celebrate our 100th challenge, we have some amazing prizes up for grabs!! I wish I could be in the running for these! We will have three lucky winners this week and each will receive a fantastic pack of crafting goodies!! Be sure to pop by the Playing in Paradise Challenge to check out the gorgeous projects my team mates have created and, of course, to see the awesome prizes that are up for grabs this week. Then come celebrate with us - I am looking forward to seeing all your celebratory projects! WOW! This is wonderful Dawn. I love that cute image and the stamps you used for the background are fabulous. The curled ribbon looks brilliant too, such a good idea to add fabric stiffener to it so it holds it's shape. Hehee your card made me smile! Gorgeous work. I hope all your friends will come Play in Paradise with us this week. What an adorable card Dawn, this image is so sweet. I love the soft colours you used. Fabulous card so love this image too! This card is fantasti and I love the stamp. Great job. Oh my gosh ... this is SO cute! Perfect image for a celebration. LOL. Love the work you've done with both ribbons ... the frame is perfect and those curly ones are genius! Thanks for the tip about the fabric stiffener ... I wouldn't have thought of that! This screams New Year's celebration! Great job with the coloring and the cute trick with the ribbon! those look like two VERY HAPPY mice, haha! They are "tipsy-ing" the glass right over. I have not really played with distress inks yet, but your card just may challenge me to try this sometime soon. Gorgeous card! Love the ribbons and the soft colors. Thanks for the warm comments. I like your creations, now I am your follower! That's fab Dawn. Although I do think that glass is going to tip over and hit that other mouse right on the head... Love the curly ribbon too, looks like party streamers.